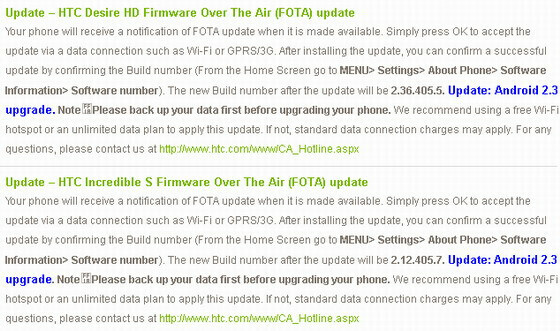 Two of HTC’s top shelf Android smartphones are getting their Android 2.3 Gingerbread makeover, seeing that the update for the latest version of the mobile platform is starting to roll out to the HTC Desire HD and Incredible S.
European owners of the device should begin to see the notification hitting their devices starting today, and it should bring the Desire HD’s build number to 2.36.405.5 and 2.12.405.7 for the Incredible S. Fittingly, these two respectable and still relevant handsets are still among the few in the market to finally see the long awaited update. Although the HTC Incredible S is moving up to Gingerbread right now, it’s still unknown when its US counterpart, the recently released HTC Droid Incredible 2, will get is crack with the new update. Despite that, HTC Droid Incredible 2 owners can sleep knowing that it’s on its way down the road. Well then, I would say since the Incredible S is getting a Gingerbread update then the Incredible 2 should be getting it fairly soon. 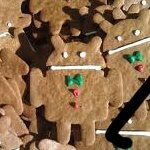 Just hope that HTC gets Gingerbread out to most all of its devices fairly soon. I cannot wait to see what kind of improvements come to the Evo Shift, and also cannot wait for the official PlayStation app and games to be available. needs to come to the atrix! Lucas777, i get my updates from ATT, what are you doing, just sucking your thumbs expecting your phone to do it by itself? Well my friend has a captivate on 2.2 android ios so what do you have to say now and my htc rep said 3.0 for my inspire 4G is comming out in july what now buddy?